I think Mother Nature must have a sense of humor. 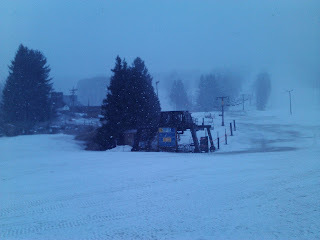 My ski adventure today included rain, snow, wind, ice, and slow going. All in the course of a few hours. After a night of rain I didn't expect very good conditions on the slope. However, the fool that I am I arrived by 9:00 AM in anticipation of the 9:30 AM start up. Three of us were ready to go as soon as the Ski Patrol started up the lift. There was one geezer (me) and father with a young daughter. Bare spots and roughness abounded. I normally ski my fat board S3's on almost all conditions. Today this was not the case. Early morning there was an icy glaze on the surface and the S3's were as squirrelly a ride you could get. At the end of one survival run I returned to the locker to get my skinny skis. The skinny skis worked fine and it was a relief to have a stable ride. Albeit a rough ride on the ungroomed surface. too much of an April fool! Someone had to represent the geezers for today and I am glad I was up to the task. Spring skiing? Yes, by the calendar but perhaps not by Mother Nature's schedule.